For some time now I had been going into the museum on Wednesdays. They are probably the busiest day of the week in the bird prep lab in terms of sheer numbers of volunteers. I went in today instead due to a heavy work load earlier in the week, and quite enjoyed the more tranquil atmosphere. Bob, a usual Wed. volunteer was in too, and he was stationed at the sink cleaning skeletons coming out of the dermestid beetle tanks. He had just returned from a trip to North Carolina, which included some pelagic bird watching. Josh, who spends a good portion of the year in Cape Town, South Africa as a birding tour guide, was in as well, making a study skin of a Scarlet Tanager. Dr. Willard had taken out 4 different kinds of warblers and one Indigo Bunting for me to make into skins. Everything had been collected last week by one of the local bird collision group monitors that go around to various Loop buildings to gather up migration casualties. One of these was a Blue-winged Warbler. I was confused at first, thinking it a Pine Warbler from just looking at its scientific name, Vermivora pinus, when in fact Pine warbler is Dendroica pinus. Bob wandered over looking at the Blue-winged, saying that it was not very common. It was an adult male, as signified by the bright patch of yellow on the crown, which females lack. For the most part, both male and female are bright yellow underneath, and olive yellow on top, with the wings being a dusty, blue-gray. It is closely related to, but very different in looks from, Vermivora chrysoptera, the Golden-winged Warbler. Hybrids of the two species can be found. Pinus benefitted initially from settlers clearing land for agriculture as it prefers open, brushy habitat, but numbers have been declining in recent years due to urban sprawl and forests reclaiming abandoned farmland. I'm beginning to feel like that could be a mantra for this blog: declining numbers due to sprawl, declining numbers due to loss of habitat, and on, and on. This painting is for sale in the Etsy shop. Sprawl is guilty of so many offenses it makes the head spin. 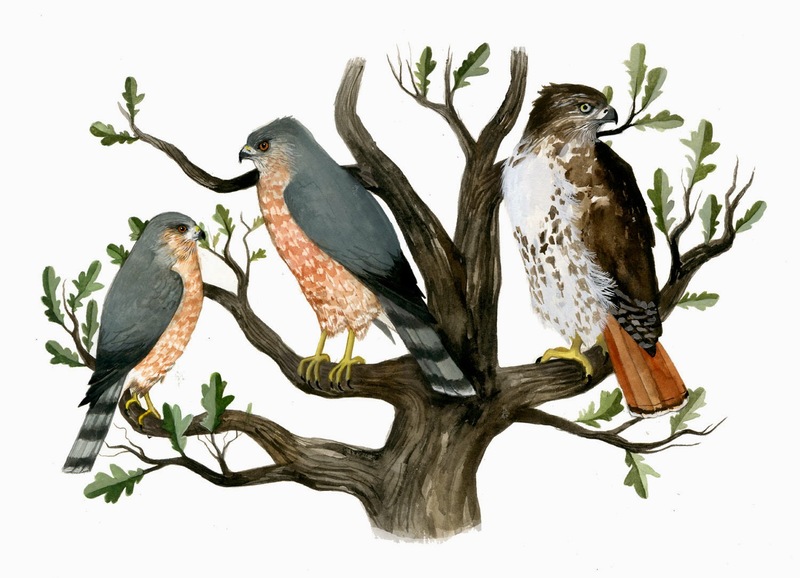 Wouldn't it be nice if those birds--as sick of the traffic and strip malls as much of the human population--follwed suit and started migrating back to the city? 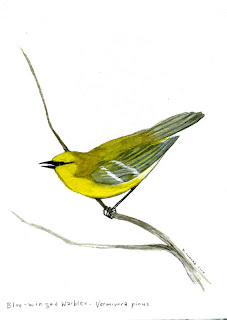 We'd see flocks of blue-winged warblers perched on our fences and trumpet vines!